The MagGrip Vent Car Mount is a sturdy, cradle-less device holding system focused on simplicity. Simply slide the rubber prongs onto your car’s air vents; place the included slim, MagGrip plate between your device and its case, and just place the phone onto the circular, magnetic mount. 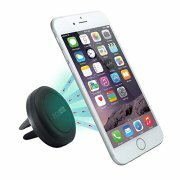 The strong powered magnet will ensure that your device is secure, while the cradle-less feature enables you to view your device without any distracting arms or holders.